Thick Film Printed Circuit Resistors are screen printed layers of resistive, conductive and/or dielectric pastes deposited on different types of substrates, like FR, CEM, Alumina, Polyester, Polyimide, PA, Dielectric on Metal etc. 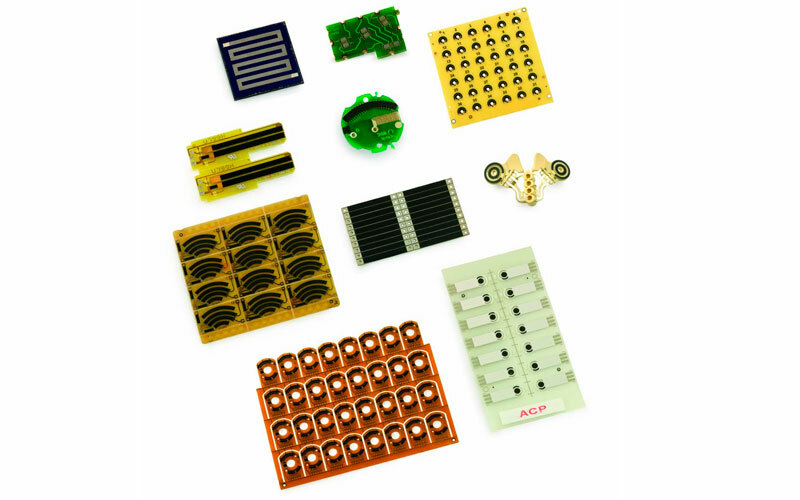 There are two basic technologies depending on the type of pastes applied: Carbon and Cermet, the latter needed on applications where high power dissipation is required or when resistor value stability at high temperatures is important. Design patterns and shapes are varied; every specific project has different geometrical requirements. We are able to process from single to multiple circuit panel configurations, with maximum panel dimensions of: 280mm - 180mm (Pattern 250mm x 150mm). Let us know about your project and our engineers will propose the most suitable designs for each specific application. In many instances, mixed solutions where Potentiometer Tracks, Trimmed, Fixed Resistors and Contact Switches are combined, make the most cost effective circuit design. - Resistive element: Resistive blends from 10 to 1M Ohm/square allow for a wide range of resistive tracks and values. - Tapers: Linear tapers with up to 1.8% independent linearity, step functions, logarithmic and antilog curves. Combination of potentiometer and on/off switches or symmetrical double track potentiometers. - Tolerance: Laser trimming up to 1% of Rn. - Minimum resistive track separation: Up to 0.3mm between adjacent tracks. - Type of substrates: FR2, FR4, CEM1, CEM2, Polyester, Polyimide, Polyamide, Alumina. - Wiper: Geometry, material, finishing, pressure, number of fingers, finger tip shape. - Inks: Type of ink, ink blend, materials contained and the process parameters when deposited and cured, geometry of the printed pad. - Speed of wiping slide cycle. - Climatic conditions: Working Temperature and Humidity. Thermal cycles: Temperature and humidity cycles. - Lubricants: They can help providing a good performance, however, they are not always needed. A detailed and comprehensive understanding of the above parameters is fundamental in order to provide the adequate PCR track and substrate: We have solutions that range from 10.000 to 5.000.000 cycles under aggressive thermal and climate conditions. Positioning Actuators, Adaptive Front Lighting, etc. Control, Light Switch, Airbag Enable/ Disable Switch, etc. Position Sensors: Feedback Potentiometers on different types of Actuators (HVAC, Window Blinds, Valve Controls,) Switches and Controls: Joystick Controls, Speed Control of Professional Power Tools, DIY tools, Garden and Lawn Electric Tools. Thick-Film solutions are customized. We kindly request a drawing with dimensions, electrical use, application, mechanical life and other significant data. Please, send us your project specifications and we will send you our proposal.